With that in mind, I scratched several possible titles to this article before settling on this one – You CAN adopt. Front runners were How We Got a Bunch of Babies for Free, Need Babies – We Got Babies, How to Adoption-Hack – Adopt for Almost Free…..yeah….none of those would have been good and I am sure others, a bit more sensitive than myself just might have been offended. So, I used my better judgment – it’s not always a whole lot better, but it’s always better than the alternative. Here is something that is true, and not in the least but funny, and that is there are a bunch of kiddos out there, in this very country, in your city, and likely near where you are this very moment, that need love. They need families – they need YOU! Just the other day, a foster-adoption momma friend was asked if she could take a 14-day old baby, that would otherwise stay the night at the CPS offices. No one else would take the baby. UGH. If this does not make your heart hurt, go check your pulse. This momma, with an already full house, including two babies, opened her home so that this little angel would be safe, secure and loved, until CPS could find a placement. And Friends, this happens every day. Every.Single.Day. Everywhere. And it is 100% preventable. We are six years out from our first adoption and since that time, we have now adopted four little boys. It’s been a crazy-wild ride and if you want to hear the whole story, it’s pretty amazing. If you’re interested, I wrote about it here . Though, hands-down the biggest, and most scary adventure of our lives, it is one we would do all over again. In a heartbeat. One might think, how could you have adopted four children? Adoption is so expensive! My response, is, yes, it can be – depending on which route you choose. Not every route is right for everyone, but for those open to adopting from foster care, you might just find that a door you thought was closed to you – is WIDE open. There are typically three types of adoption, private domestic, private international and adoption through the state. We are only going to cover state adoptions here. We know several other adoptive parents that have chosen both private domestic and private international, each one has their own risks and processes. If you want to learn more, I may not have all the answers, but I am pretty good at finding where to point you to get them. Choose your agency to assist with licensing. Arizona requires 30 hours of training (called PS-MAPP). Again, each state is different. Attending this training is so important. You learn some of the special needs you may encounter with children who have been placed in foster care. It is also a really good way to know, for certain, if foster-care or foster-adoption is right for you and your family. These classes were critical to our understanding of what we should expect; we learned so much. It is true, you don’t know, what you don’t know. The best part of our classes were the people we met. We met grand-parents, single women, single men, relatives, families struggling with fertility, all different walks of life and cultures. It was amazing to be surrounded and supported by people on the same journey as we were. Our agency was with us through the entire adoption process and helped us keep moving forward. There is a ton of paperwork and other steps that must be completed, a home-study for instance, and, in all honesty, at times the process was over-whelming. So, it was comforting to have a someone by our side the whole way. Depending on your license and the preferences you have stated in your questionnaire, your placement will be a child who is already available for adoption (parental rights severed) or not. In our circumstance, we initially asked to have a child placed with us whose parental rights had already been severed; initially we felt, like a lot of people who consider foster-care, that we could not “have a child placed with us and then lose them.” However, during the process, our hearts were changed – we took a risk – and, had we not we would not have been given our Jake. You can find how we arrived at that decision here. From the day of Jake’s placement with us to his Forever Day, the process took thirteen months. During the time he was a foster child, we received a small monthly stipend and clothing allowance to assist us while he was in our care. He also received free medical care and other assessments. We felt very supported during the entire process. There were required medical visits and other appointments we were responsible for, and for a time, there was visitation with his birth mother. This is not always the case, and other times a child is returned to their parent(s) or it is determined a kinship placement is more appropriate. These are all risks to consider if you choose this route. The one thing I try to help people understand when considering foster-adoption is this. There are risks with foster-children. Risks of being heart-broken (we’ve been there – it’s the hardest pain we’ve ever experienced). Risks of having a child with mental health and/or other medical issues due to the actions of his/her birth parents. Risks that you may be asked to care for more children than you anticipated….These risks are the SAME with naturally born children. When our children are born – there are so many unknowns. This is the nature of parenthood. Parenting is a wild ride…whether your children have the same DNA or not. These same risks are present with private adoptions, domestic and foreign, as well. Your Forever Child. Every Halloween and Every March 25th, we celebrate the adoptions of our four boys. Jaycob was our first adoption and Halloween is always a super special day for us. Our other three boys were all adopted on the same day, March 25th. Both days are a celebration for us – much the same as any of their birthdays. Our children have been the greatest blessing in our lives. We never expected how they would change us. Change our whole family. After the Adoption. Once your child(ren) are adopted, one of the best parts is that the state is no longer part of your daily lives. These are now (officially) your children! While this is cause for celebration, you should also know that some of the support you once received will no longer be there. You are 100% responsible now for your child – just as any parent should be. Some services you may have received for the child(ren) as well as some of the financial support terminates. This includes the monthly stipend and clothing allowance, as well as daycare allowances. However, one benefit that your child may qualify for is a small monthly subsidy to help offset additional expenses you may incur by adopting a child that is considered “at-risk” and/or “special needs”. Former foster children also may be eligible for ongoing healthcare, which is a huge benefit. If you have primary coverage, this benefit will become secondary, which is extremely helpful if your child has ongoing medical needs. A more thorough description of these benefits can be found on the NACAC website listed above. I could spend an entire day, or more, going into more detail…if you haven’t noticed, I am super-passionate about foster-adoption. There is SO MUCH MORE to know if you are considering it. 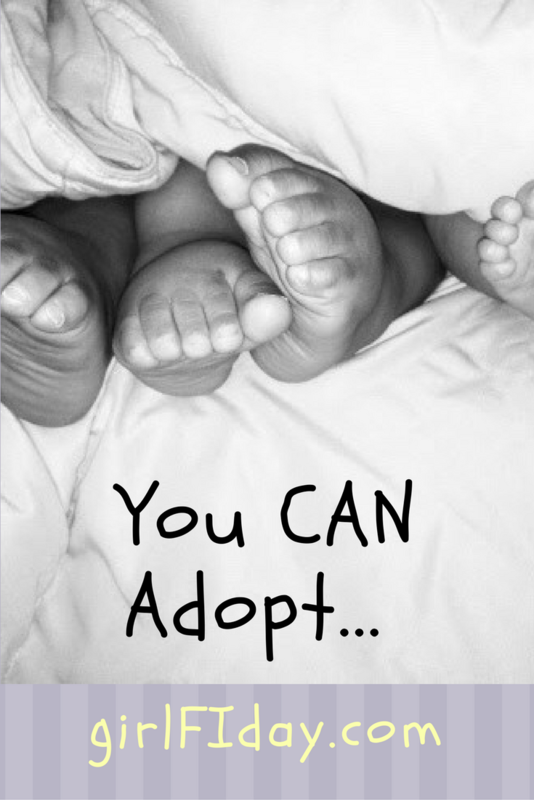 My hope is that this post has helped you understand the basics and to know that, if the expenses of adoption is what is stopping you from adding to your family, there is another way. There is a path to adoption – that will not derail you financially. You CAN adopt! And if you simply want to know more….LET ME KNOW. If I cannot locate the answer for you, I will find someone who can. I’m adopted and I always say that I have no doubt that my mum saved my life by doing so!